U. S Christmas Seal Collection Kit; U.S. National Christmas Seal Collection, 1920-68, as required, singles, pairs, and blocks, with Colorful Blank Album Pages in package of twenty (20) sheets. U.S. National Christmas Seal Collection 1920-1968, with Colorful Blank Album pages. Just add your own binder. Christmas Seals: U.S. National Christmas Seals 1920-1968, as required, singles, pairs, and blocks. This set is fresh, P4S, F/VF and MNH. Scan is an example of the collection. Excellent start to your Christmas Seal collection. Seals in this collection are as follows: single stamps: 1920-1935, 1937-1942, 1944-1953; se-tenant pairs: 1936, 1943, 1955, 1958, 1959; blocks of 4: 1954, 1956, 1957, 1960, 1961, 1962, 1963, 1964, 1965, blocks of 8; 1966, 1968, blocks of 10: 1967. This is the assortment described in the Scott and Green's Catalogs, required to complete the various albums. Album Pages Christmas Seal Album Pages, blank pages, package of twenty (20) sheets. All that is required is the addition of seals, and an album cover. Design your own placement of your seals. The headings and borders are in full color. Printed on heavy, acid-free 67 lb., ivory or white card stock, with rounded corners. Printed on one side. Standard 81/2x11 inch 3 ring punched. Saint Crispen Publishing. Stamp Hinges: Uni Safe Prefolded Stamp Hinges, 1,000 hinges. Hinges are made from a special acid free gummed paper. Prefolded for convenience, and to save time. 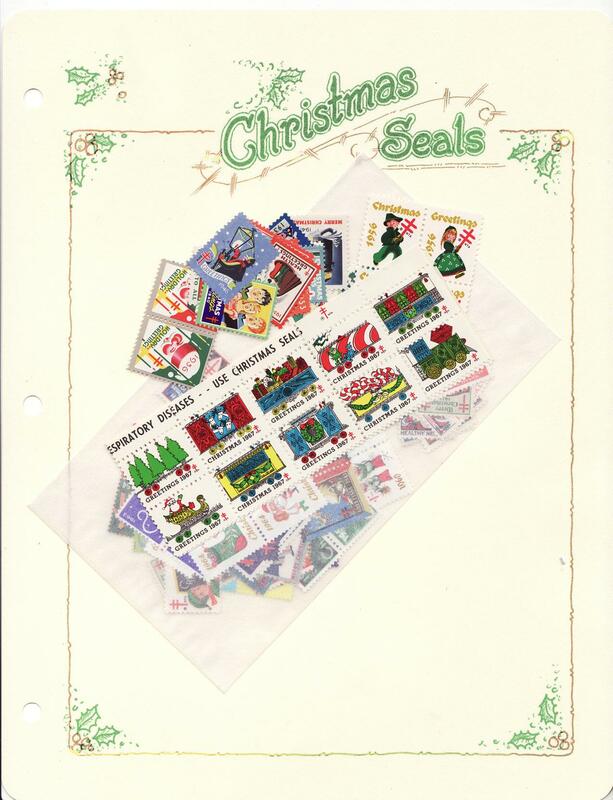 Add a Green's Catalog, Part 1, U.S. National Christmas Seals, 2014 ed., CD for $8.75 more. Green's Catalog, Part 1, U.S. National Christmas Seals, 2014 ed., CD This catalog illustrates in color and prices U.S. National Christmas Seals 1907 through 2011, and ALA Spring Seals 1987 to 2011. U.S. National Christmas Seals and ALA Spring Seals for 2012 and 2013 are identified, with images, however they are not priced by the society.